Charles Ross & Son Company now offers a variety of surface treatments, coatings and alternative materials on its full range of mixing, blending, drying and dispersion equipment for the processing of high-purity, sensitive, corrosive or abrasive products. 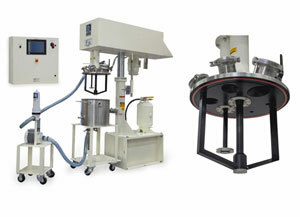 Pictured is a custom Dual-Shaft Mixer equipped with a PEEK (polyetheretherketone) High Speed Disperser and a Two-Wing Anchor Agitator completely coated with black Teflon PFA, a perfluoroalkoxy copolymer resin with a high level of inertness. The wetted surfaces of the stainless steel vessel, cover and charge ports are all PFA-coated as well to prevent metal ion contamination. Designed for a high-purity electronic application, this vacuum-capable inert mixer includes a recirculation filter system. Operators control and monitor the agitators, recirculation pump, recipe menu, temperature, vacuum level and data acquisition from a 10” color touch screen. Experienced in working with abrasive and challenging applications, Ross offers a number of coating options such as aluminum oxide, chromium oxide, polyvinylidene fluoride (PVDF), nylon and tungsten carbide. Other surface treatments include electropolishing, boronizing and hard chrome plating. The company also manufactures storage tanks, pressure vessels and reactors that can be lined with any appropriate chemical-resistant coating.